Backbreaker was released on June 1, 2010, for both the PS3 and Xbox 360. The game released with a MSRP of $49.99 and features 60 football teams, a season and "Road to Backbreaker" mode; as well as an online exhibition mode. One big selling point for Backbreaker, is its use of the Euphoria game engine, which was also used in games like Star Wars: The Force Unleashed and Red Dead Redemption. The chart above shows the sales ranks for Backbreaker on the PS3 and Xbox 360, with data captured between May 31, 2010 and June 30, 2010. The highest recorded sale rank for Backbreaker on the PS3 was #332, on June 2, around 10:40AM. The lowest recorded sale rank for Backbreaker on the PS3 was #5,915, on June 29, around 12:05PM. The highest recorded sale rank for Backbreaker on the Xbox 360 was #216, on June 1, around 8:05PM. The lowest recorded sale rank for Backbreaker on the Xbox 360 was #4,829, on June 28, around 12:40AM. 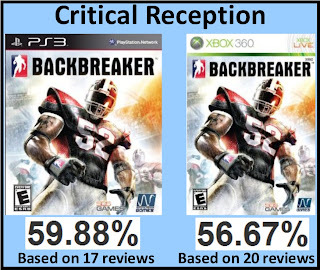 Backbreaker on the PS3 currently has a review score average of 59.88%, based on 17 reviews. 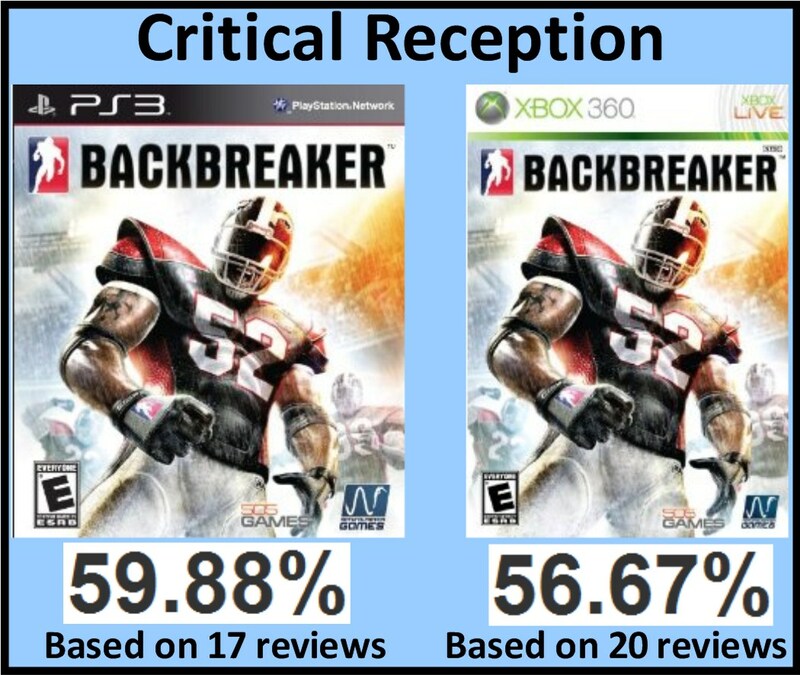 Backbreaker on the Xbox 360 currently has a review score average of 56.67%, based on 20 reviews. The chart shows, with the lightning bolt, that on June 2 IGN.com posted their review for Backbreaker. I believe their review was posted around 8:30PM(EST) on June 2, and they gave the game a 5 out of 10. Many other sites started posting reviews for the game on/around June 1, but I just found it interesting that after June 2, the same day IGN.com posted their review, the sale ranks for bother versions of Backbreaker steadily decreased. I have not purchased a football game since ESPN NFL 2K5. I read some of the comments on IGN's review for Backbreaker, and they were stating that the reviewer did not spend enough time with the game; before writing the review. I don't think the Amazon.com sales data shows the game is selling very well, but perhaps it is doing better in retail stores than online? I think if the game released with a price tag of $19.99, like ESPN NFL 2K5 did, then more people would have been willing to give it a try. I did download the demo for Backbreaker on my PS3, and played a few matches. The passing took a little while, but I was getting used to it. I still am adjusting to the running, though it seems kind of loose to me. Have you played Backbreaker on either the PS3 or Xbox 360? If you purchased the game, what do you think of it? Do you agree with the review score averages for the version you played, or do you agree with comments that the reviewers needed to spend more time with the game before "reviewing" it? World Cup Madness! North American Soccer Games Data! The World Cup is going on right now, and with only eight teams remaining, I really have no idea who the favorites are moving forward. I have never really followed professional soccer, even though I did play little league soccer for a few years growing up. In this post, we will look at four soccer(or football in Europe) games on the Wii that all have game-play data reporting. 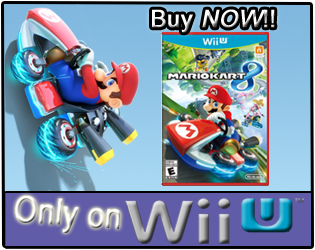 We are looking at Mario Strikers Charged, FIFA Soccer 09 All-Play, Pro Evolution Soccer 2009, and FIFA Soccer 10. As the image above shows, Mario Strikers Charged was released on July 30, 2007. The data shown was collected approximately 1,065 days since the game's release. FIFA Soccer 09 All-Play was released on October 28, 2008; The data shown above was collected approximately 609 days after the game released. Pro Evolution Soccer 2009 was released on March 17, 2009. The data shown was collected approximately 469 days after PES 2009 released. FIFA Soccer 10 was released on October 20, 2009, and the data was collected approximately 252 days after it released. 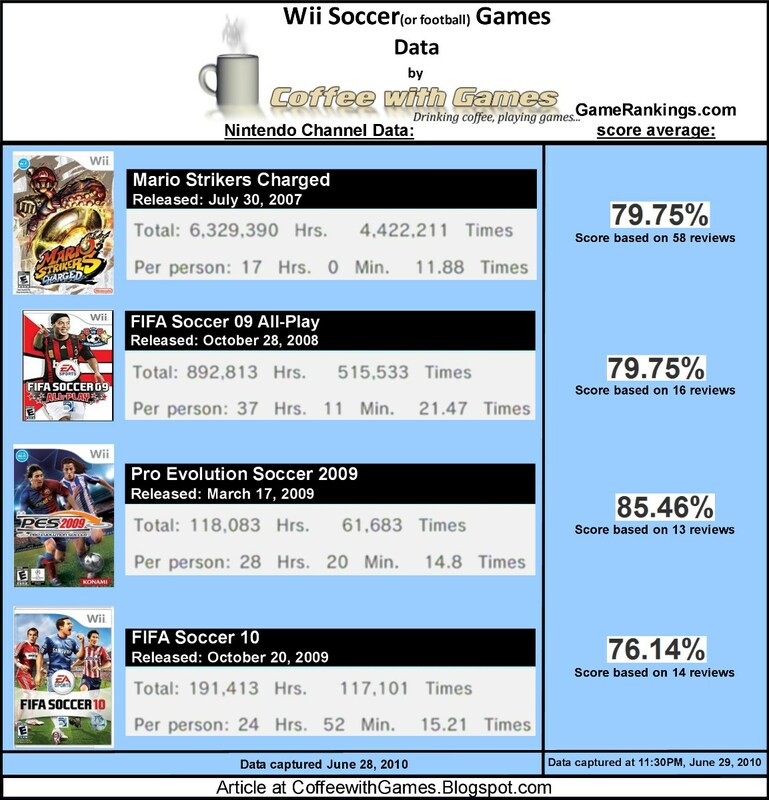 Mario Strikers Charged has 372,239 players reporting play-time data. 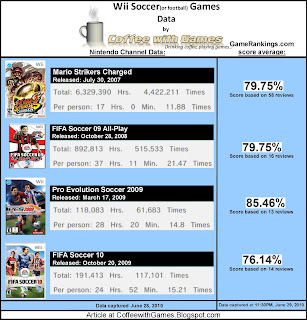 FIFA Soccer 09 All-Play has 24,011 players reporting their play-time data. Pro Evolution Soccer 2009 has 4,167 players reporting Wii play-time data. FIFA Soccer 10 has 7,698 players reporting data. Mario Strikers Charged 's Amazon.com sale rank is #835 and the current selling price is $52.68, from a third party vendor. FIFA Soccer All-Play 09 's Amazon.com sale rank is #997 and the current selling price is $18.49, from a third party vendor. Pro Evolution Soccer 2009 's Amazon.com sale rank is #4,997 and its current selling price is $64.99, also from a third party vendor. FIFA Soccer 10 's Amazon.com sale rank is #1,110 and the its current selling price is $46.99. I have only played one out of these four games. The game that I have played is Mario Strikers Charged. Mario Strikers Charged is definitely not like the FIFA or Pro Evolution Soccer games; but Mario Strikers Charged is more an arcade soccer game. If you have played the NHL Hitz games, those games have the type of game-play you should expect from Mario Strikers Charged. The one thing that surprised me the most about the data, is that Pro Evolution Soccer is lower than both FIFA games reporting data. I remember reading about Pro Evolution Soccer when it first released on the Nintendo Wii, and I remember reading how the controls in the game were a great step forward for soccer games. I don't remember reading a lot about the FIFA games, but I do have a friend that has rented one of them, and he seems to have enjoyed it each time he has rented it. I know that Pro Evolution Soccer 2009 already has a sequel(2010), and that EA released 2010 FIFA World Cup; but at the time of this posting, the four games shown are the ones with data reporting. If you were not following/reading my blog back in January, you may have missed my post about several canceled Wii games. Mario Strikers Charged was one of the games that was mentioned as not being produced or shipped any long by Nintendo of America. I don't think that status has changed, as the game is currently only available on Amazon.com from third party vendors. If you missed the blog post about the canceled Wii games, the direct link for the post is: http://coffeewithgames.blogspot.com/2010/01/nintendo-stops-shipping-and-producing.html#comments. Have you played any of these soccer games? If you have played both a FIFA and Pro Evolution Soccer game on the Wii, did you enjoy one more than the other? If you have only played one of these games like myself, did you enjoy whatever you played? Being that the World Cup inspired this blog post, do you have a team that you are still cheering for in the World Cup; if your team has already been eliminated, who were you cheering for? Sin and Punishment was originally released on the Nintendo 64 in Japan on November 21, 2000. 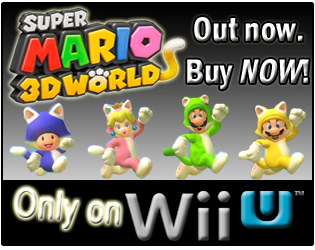 The game was not ported to North American or European N64s. Sin and Punishment may not have been released for European and North American Nintendo 64s, but Nintendo did re-release Sin and Punishment on the Wii's Virtual Console for Europe, Japan, and North America. North America received Sin and Punishment on the Virtual Console on October 1, 2007, for the cost of 1,200 Wii Points . The data shown above in the image is for North American Wii owners that downloaded Sin and Punishment off the Virtual Console. The data was collected approximately 1,002 days since the game released on the Virtual Console. Sin and Punishment has 42,058 players reporting their play-time data, as of today(June 28, 2010). The North American Virtual Console version of Sin and Punishment has made Nintendo approximately $504,696 since it was released. Though Nintendo did not release the original Sin and Punishment in North America or Europe, perhaps the Virtual Console numbers showed them North American Wii owners enjoyed the game. Just yesterday, Sunday, June 27, 2010, Sin and Punishment's sequel, Sin and Punishment: Star Successor was released on the Wii in North America. If you could not tell from the footage shown, both games are "on-rails" but allow you to move around depending on the level design. I think it is going to be interesting seeing how Sin and Punishment: Star Successor performs in North America. Did you play the original Sin and Punishment? If so, would you recommend it for the cost of $12 on the Virtual Console? If you did or didn't play the original, either way, did you purchase Sin and Punishment: Star Successor yesterday; or do you plan on purchasing in the near future? Each video game or video game accessory listed below is at least 25%, as of June 27, 2010. If I notice the prices change during the week to a savings of less than 25%, I will take them off the list. Each game should be properly linked directly to its Amazon.com page. Would you recommend, or not recommend, any of these games based on their prices? Monster Hunter Tri: The Game that Eats Time! James Bond 007: Goldeneye's Release Date?